The church is a respected and complex institution. The parishioners of a church have many expectations from it. The church is the most credible of today’s institutions, giving people, besides spiritual ascension and peace of mind, greater confidence that inside it everything runs correctly. Caring for his parishioners, for their spiritual and material needs is a priest’s continuous preoccupation. But a church leader’s mission is much more difficult and complex than this, since he not only has to accomplish spiritual tasks, such as praying, worship Sunday Mass and other worship services, but also administrative and financial accounting tasks. So the duties for a priest who is eagerly doing his job may seem to never end: the religious service, offer management, updating data on the parishioners, the organization of voluntary groups etc. These diverse and complex activities can be carried on easier and with much more success if church leaders resort to modern problem management solutions, like special software packages for churches. Using church office software, the pastor's office administration tasks become more easier, faster and more accurate to manage, data can be updated constantly, everything is done with much less effort. members to perform various common activities. - Data on major events in the parishioners’ life, photos, their needs and availability. 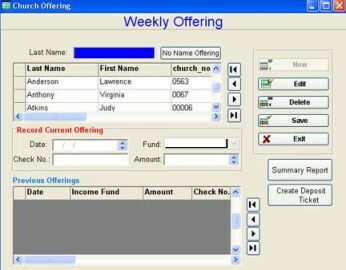 Church office software allows printing important documents such as labels, accounting reports which can also be sent to parishioners to let them know about the financial status of their church and on what the church’s funds were spent. You can create a calendar for scheduling various events, scheduling home visits to parishioners or visitors and even keep evidence of your visits as well as a small description of the results of these visits. Another advantage of using church office software is the confidentiality of your data by introducing a password for accessing sensitive information. For the person who works with these data significant time savings can be made if the equipment (PC, laptop) is connected to the Internet, thus allowing the person in charge to introduce new data or prepare various reports at any time and from anywhere there is an Internet connection. Choosing the suitable church office software for your ministry is very important. The pastor or church administrator must know exactly what he needs to keep under control, so that he can choose the software according to his needs and taking into account the financial possibilities of the church. He must focus on what is important for his ministry, make a choice based on the specific needs of that church. Good church office software must be able to store and process data about church members, families, groups, events, grants, donations, be able to issue various reports and offer users the opportunity to print them. Next we will present two church office software solutions. Church Office Helper is a management programs which offers a lot of useful tools. 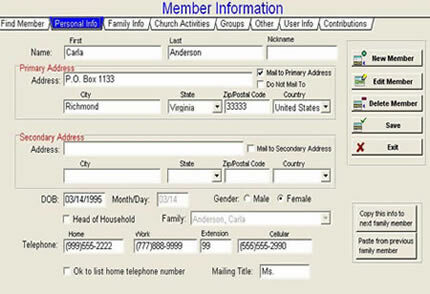 Besides keeping personal and contact information on the members of your congregation, the software contains modules for storing and managing attendance, sermons and worship, church budget and finances, church policies, data on paid staffing and volunteers personnel, pledges, gifts and donations, the church music library, photo directory, talent survey for each individual and church history. The software has over 100 pre-configured lists, analysis reports and address labels. Users have a number of customizable fields for their own, desired use. Important data can be protected by creating used Ids and passwords for authorized personnel. You can also import/export data from/to DBF or HTML. The standard price is $75 for the old version or $95 for the new one. You can get a free trial of the two versions at http://www.ads-software.com/down_log.htm. ChurchOffice from Pastoral Care Solutions is especially designed for small congregations, where almost all the work is done by the pastor, but it can also be successfully used in larger ministries, where the administrative tasks are left in care of the church staff and volunteers. The software is very intuitive and easy-to-use, not to mention free. It will give users an easy way handle administrative tasks like record membership data, donations, mange pledges, print directories and reports, issue receipts, schedule events, prepare statements and more. You can order a copy and user manual at www.churchoffice.com/c/churchoffice/tour/order.html.